Thanks to over 70 volunteers, our colleagues in other organizations, and dozens of local businesses, Session 1 of Bark's Summer Base Camp is officially our biggest and most far reaching groundtruthing camp out ever (at least until Session 2, which starts next week)! Barkers from as far away as Bellingham, WA came out to help us with the work needed to protect Mt. Hood forests, rivers, and wildlife. Together we groundtruthed nearly 40 proposed logging units in the Hunter Timber Sale. We’re now halfway done field-checking the project, and boots-on-the-ground in all the remaining units will help us make a strong case for protecting the most ecologically sensitive areas of the beautiful Upper Clackamas watershed. We also launched a project to collect flowering plant seed for pollinator habitat restoration. To kick off our new native seed-collecting program, volunteers gathered seed from important species to support a Forest Service restoration project focused on improving habitat for bees, butterflies, and other critical pollinators. There will be more opportunities to help with this work during Session 2! We are also very lucky to have great educator friends in the region who hosted amazing workshops and activities at camp including volunteer-led native plant walks, print-making workshops, Forest Forum Theater (to return again for Session 2! ), Caminata en la Naturaleza (an interactive ecology hike facilitated in Spanish! ), and much more. Session 2 is going to be even better! Come camp with us anytime between August 30th - September 12th. Check out the Session 2 event schedule here. 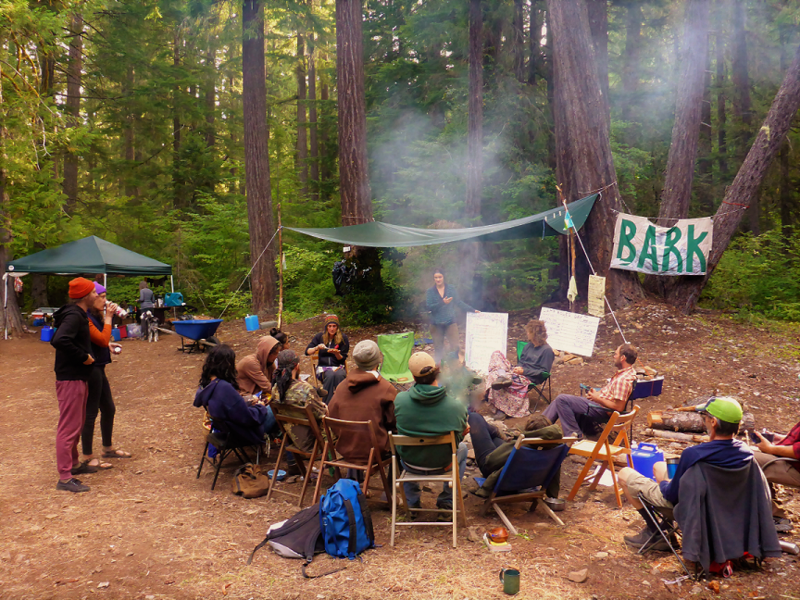 We’ll be posting more details on http://bark-out.org/basecamp, including driving directions. If you are available to be a driver, sign up at our carpool page. P.S. We’re searching for donations of food and gear to make Session 2 as welcoming and inclusive as Session 1. Please take a look at our donations wish list to see if you can pitch in!